Pam Clarke, President of the Westhoughton Local History Group, has written this account of feasts and celebrations including a possible explanation for the ‘Cow head’ name given to residents of Westhoughton. The townsfolk of Westhoughton had suffered extreme hardship during the French wars; they had also become victims of the Luddites when a mob destroyed one of the world’s first weaving mills with looms powered by a steam engine. Union mill, Westhoughton, was built in 1804 and burned to the ground in 1812. In 1815 after Napoleon’s army was defeated at the Battle of Waterloo, ending the war with France it was decided that an ox should be roasted to celebrate the historic occasion. The site chosen for the feast was on the land where the ruins of the mill still stood opposite the old coaching Inn, the White Lion. People came from the outlying hamlets of Wingates, Chequerbent, Daisy Hill, Fourgates and Hart Common to join in the feast and football games were played between the teams of men from the various parts of Westhoughton. The ‘trophy’ was not a silver cup it was the head of the beast they had just feasted upon. The victors would parade around with the head mounted on the top of a pole. This tradition was kept up annually for many years and a nick-name for the town’s people was born – ‘Keaw-Yeds’ (cow heads). 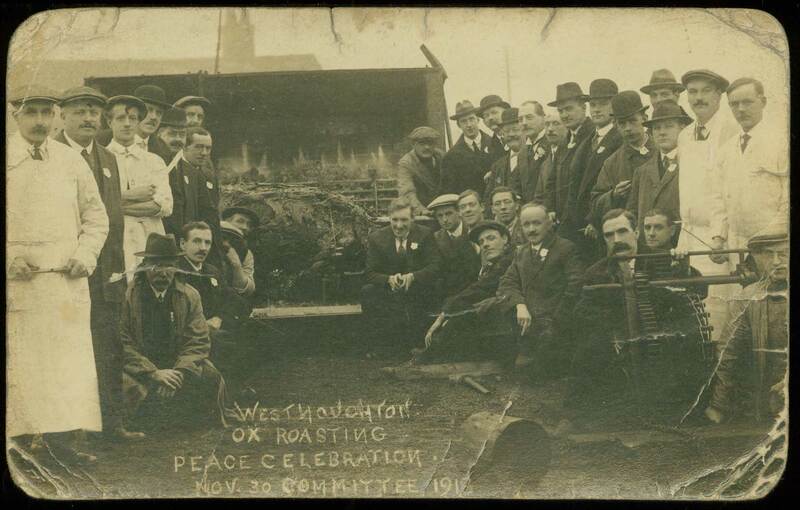 To celebrate the end of the Great War in November 1918 the townsfolk of Westhoughton decided to keep this old tradition alive and a public ox-roasting was again held on the very same ground where the old cotton mill once stood. It is reported that 3,000 schoolchildren marched along Market Street in a procession led by Wingates Temperance Band as it was then called. The Ox was donated by William Heaton of Lostock, who was a mill owner, the spit-roasting equipment was made at the Westhoughton Gun Works and the first cut of the ox was made by Mr Allden OBE, officer in charge of the Royal Naval Gun Factory, which was located off Church Street, Westhoughton. In 2011, the members of Westhoughton Local History Group were given a hoof which is said to be from the ox which was roasted in 1918. This hoof has been made into a gentleman’s stud box; it was varnished and fitted with a decorative brass lid, which is engraved with the date of 30th November 1918. 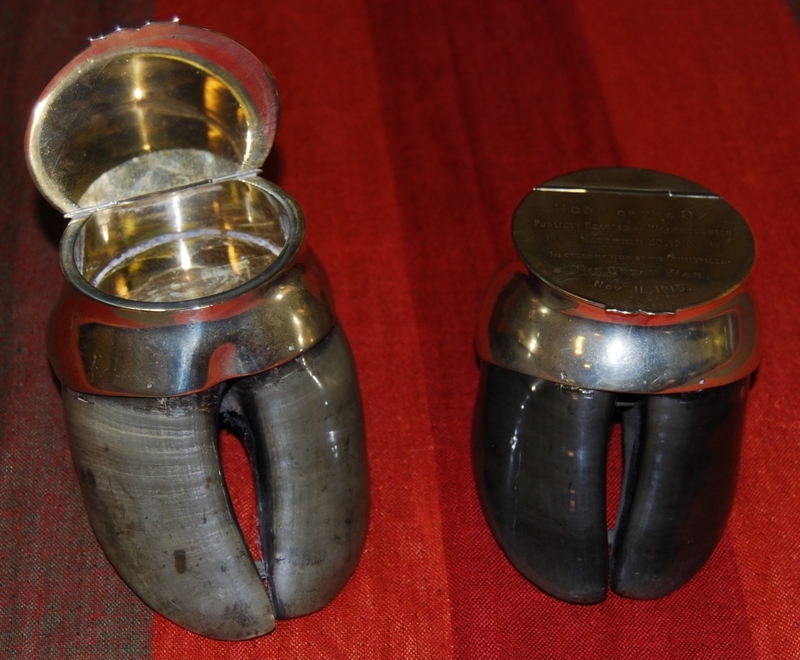 Some months later, a similar ox hoof was given to the Westhoughton Local History Group – now custodians of two! Maybe the original Keaw’s Yed will turn up one day, but it must have provenance! 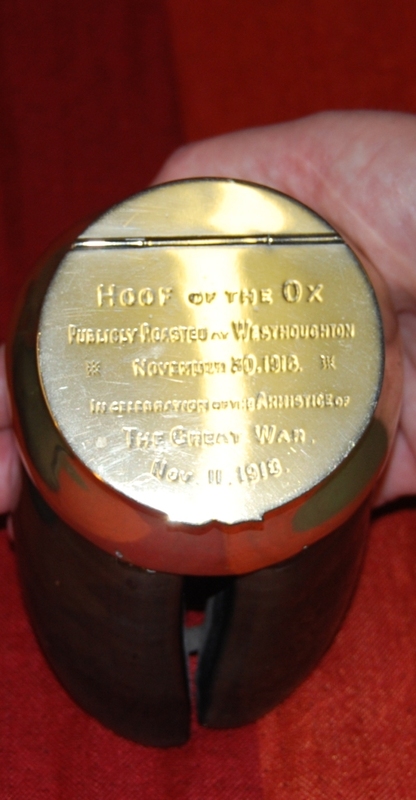 Description: Ox Hoof, which has been preserved – varnished and fixed beneath into a silver top, this has a hinged lid with the following inscription: HOOF OF THE OX PUBLICLY ROASTED AT WESTHOUGHTON NOVEMBER 30 1918 IN CELEBRATION OF THE ARMISTICE OF THE GREAT WAR NOVEMBER 1918. 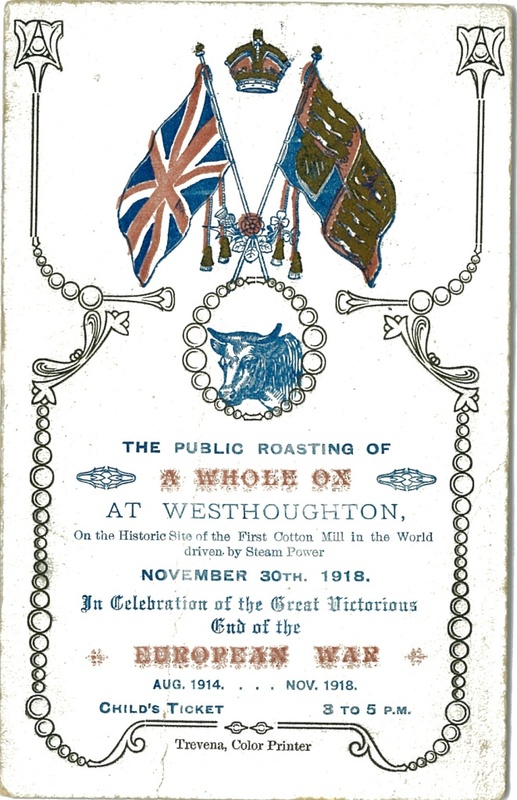 Ox roasting invitation card 1918 BOLMG 2012.4.4. Bolton Museum Collection. my dad passed away 2 years ago,originally from preston .in his belongings i found an original post card from the ox roast dated november 30 1918.is it worth anything and should i hold onto it.i am from canada.